For many years, etched in my mind was one question asked by the author of an article published in an International Homeopathic Journal. To paraphrase: “Why are there still homeopaths dying from diseases such as cancer?” “Why?” indeed. The assumption is that as homeopath we ought to be able to heal ourselves, especially when we know homeopathy is such a wonderful healing tool. It not only heals from the mental, emotional down to the physical level, but also has the power to take away the inherent miasms layer by layer. A deep pathological manifestation such as cancer, then, ought not to happen. Yet, it does happen. Not only could we as homeopaths die from cancer, but we are neither impervious to the variant diseases ravaging our body, nor are we spared from addictive behaviour in spite of the remedies we use. Are diseases and addictions to be a part of life’s reality just as aging and death? If we can change and grow in consciousness the answer will have to be no. Diseases and addictive behaviour can be considered as the physical and emotional expressions of an inner reality of the soul, or in Jungian terms, of the “psychological complexes.” They are part of one-self and therefore are “creative expressions” of the soul when other avenues for expressing our creative energies (e.g. ability to speak one’s truth) are blocked. We are able to see how we express our own energies or inner reality when these are reflected outwardly as concrete events. Just as a mirror reflects whatever comes before it, so life’s balance is constantly maintained in the dance of the inner and outer realities. The inner and outer (or the apparent opposing forces) are aspects of the same thing seen from different points of view. The more we identify with one end of polarity (e.g. light and dark) the more likely the opposite will come into manifestation as external events, because the opposite of the pole is yet to be consciously integrated into the personality. Physical diseases or life’s happenings are reflections through which we might understand how we are managing our energies. If we are willing to look at the reflections, our awareness of such could lead to changes within ourselves - we may become less polarized and more balanced or aligned to our soul purpose. When disease/illness is considered as an expression of the soul we may realize that our individual self at its deepest level holds the key to healing. This article explores the answers, from a spiritual stance, to that question asked by a homeopath many years ago. This spiritual perspective is not new, as it is upon the spiritual that the foundation of homeopathy is built. We accept this spiritual premise - “the spirit like dynamis” - irrevocably when we practice our art. Here, the fundamental concepts of homeopathy (the vital force) will be weaved in with the knowledge of the chakra system, human auric field, susceptibility, and disease manifestation as a path to higher consciousness, to form a coherent understanding of the role of disease in life. This is an alternative view that will take us outside the traditional orthodox medical model in relation to mental, emotional, and physical illnesses and their manifestations. If we view any form of disease manifestations or addictive behaviour in oneself to be shameful or the result of personal failings, then we have missed the purpose of this article. I would have never come to know the wonderful healing tool of homoeopath if it were not for my own personal health problems. I hope that a true sense of compassion will come through these words readily, because there necessitates a tremendous personal courage and compassion for the self in order for one to embrace all manifestations in one’s life as reflections of oneself, and to begin the journey in healing one’s own soul. Two of the cornerstones of homeopathy, vital force and the minimum dose, are pivotal in perceiving homeopathy as vibrational medicine. “[The material organism] derives all sensibility and produces its life function solely by means of the immaterial wesen (the life principle, the life force) that enlivens the material organism in health and in disease” (Organon, Ã‚Â§10). Healing in homeopathy is to take place at the level of the dynamic spirit-like life force with remedies that embody pure energy with “no-thing” in them. If the remedies selected (simillimum) are to heal, they must also be resonant (more powerfully) with a similar vibrational frequency band in our individual life force, our mind and emotional energies. The challenge in practicing homeopathy, then, is to find the core essence of an individual - the foundation for the expression of one’s life force - and its corresponding vibration found in a remedy. This explains why our primary concern in case taking should be to elicit the mental and emotional patterns that reflect an individual essence, with less emphasis on the physical disease symptoms. Scholten’s Element Theory and Sankaran’s Miasmatic Approach provide us with a window into an individual’s essence. The idea of the “essences” is not new; homeopathy was taken a step further, in the seventies, when Vithoulkas explored the essence of the remedies. If we look at the physical manifestation from the stance of individual essence, then, the disease symptoms are only secondary and consequential to the activities at the higher spiritual level. They are, therefore, particular, peculiar, incidental, or idiosyncratic to each individual in accordance with one’s own constitutional make-up and state of consciousness. When the essence of an individual – the core of the problem - is understood and healed, the healing of physical symptoms will follow. The word “proving” means just that, to prove. Cured symptoms are clinical provings of what a remedy is capable of healing. The traditional full proving reveals those symptoms that a remedy could possibly heal, but not necessarily so. Inherent in the traditional proving symptom picture is the unavoidable bias resulting from the inability to take the provers’ individual idiosyncrasy out of the picture. If we take our bias in favouring the traditional full proving out of the equation of healing, what is left is a remedy that can heal if it is truly the simillimum to the individual. What it cures are the clinical symptoms. The approach of Scholten and Sankaran addresses this level of healing, and also vastly expands the very concept of homeopathy as a vibrational medicine, because the core essence of an individual is energy. Their methodologies may appear to be deviant for many practitioners, but in fact they are extensions of the same tradition. We may consider their methods outlandish because they challenge us, as homeopaths, to truly know the essence of an individual. Although physical symptoms can point to a likely remedy, these are not the determining factor for prescribing a remedy (with the exception of a few first aid remedies). After all, homeopathy is a healing modality that works from the top down rather than from below upward. All thoughts, emotions, spoken words, etc. create their own vibrational signature that profoundly affects one’s cellular structure over time. If we trace the path of a disease manifestation, we may come to know what an individual needs to change to bring about the balance required for healing to take place. When homeopathic remedies heal at the vibrational level they can change the quality of the vital force. Homoeopathy considers the dis-ease condition to be the result of a weakened or disturbed vital force – "disease as a dynamic expression of the disturbance of the harmony and rhythm of the vital energy" (Roberts, 1982:37). There cannot be disease if vital force is in harmony and synchronized with life’s creative expression. The centrality of vital force in health and disease is found throughout ancient civilizations, i.e. Chi in the Chinese traditional medicine. The Hindu concept of Prana expresses a similar idea. In Chinese medicine, the concept of Chi relates to the life force that animates and energizes living organisms by way of the complex meridian system. The state of health, according to the Chinese, depends upon the balance of all the elemental forces of air, water, fire, earth, and metal. Prana commonly refers to the universal energy related to the breath, but is in fact the basic constituent and source of all life. In addition to the vital force having its conceptual equivalent to both Chi and Prana, vital force can also to be considered as another name for the human aura, which is an energy field with many layers surrounding the physical body. This energy field is intricately linked to our physical body via the seven major chakras – the energy vortices. These are vortices for energies to flow in and out of our auric field. Each of the seven major chakras metabolizes and distributes the universal life force that flows downward from the crown of the head and upward from the base of the torso (coccyx). They distribute the subtle currents along the energetic threads called nadis to the nervous system, the endocrine system, then to the blood to nourish the body. The chakras affect the levels of our hormonal secretion, influence our emotional state and mental perception, our immune system and our metabolism. The more freely the energy flows, the healthier we are. Illnesses are caused by the imbalance or the blocking of energy distribution in the body. The seven major chakras not only have a close relationship with our physiological functions but also correlate with the development of consciousness. It is in this inter-connectedness that each level of manifestation serves as a mirror to the others. The chakras thus may be considered as the gateways or exchange stations between our physiological system, the universal energy, and the energies emanated through individual belief systems and perceptions that impact on our thoughts, attitudes, emotions, feelings, etc. In turn, they may also determine and influence how we manifest our creative energies in our lives’ events and in the state of health. Although the chakras are not physical entities in and of themselves, they have a powerful effect on the physical body – the embodiment of the spiritual energy on the physical plane. Our health and vitality depend on the proper functioning of the chakra system. Just as each of the chakras is associated with a specific part of our physiological system, so they also relate to psychological developmental patterns. How well a chakra may function in its capacity as the “gateway” depends very much on one’s experiences during the developmental stages of life, as well as one’s development in consciousness through meeting life’s demands and the many challenges one faces. The exploration of the chakras here is to elucidate a link between the physical manifestations, the psychological pattern, and the development of consciousness. Our understanding of this interconnectedness can assist us to manage our creative energy more effectively, which could lead to healing of the self. 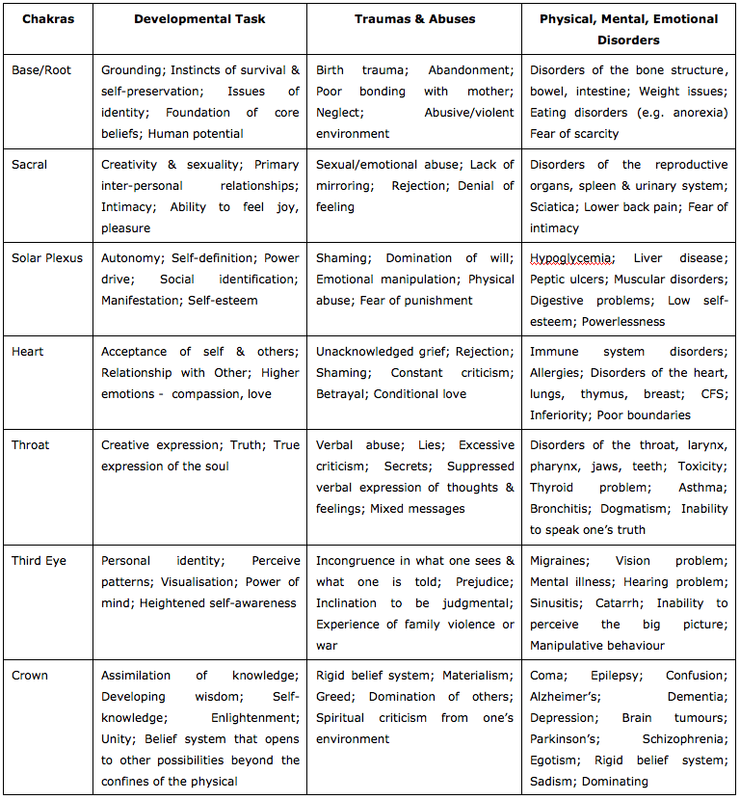 The Table below briefly outlines the developmental tasks, traumas and abuses, and the related physical, mental, and emotional disorders that can be associated with an imbalanced chakra. Any form of injury to the chakras may lead to conditions such as ungrounded fear, mistrust, skewed perceptions and distorted belief systems about oneself and others. These influence how one interprets one’s place in the world, in turn, affecting one’s value-based choices in life to create individual reality. The first three chakras form the lower trinity - the foundation of our growth that enables one to effectively utilize one’s inherent gifts and abilities. This foundation determines how one develops the higher aspects of human evolution represented by the upper trinity - from the fifth chakra to the seventh. The fourth chakra, the heart, is the center of balance - performing the task of synthesizing our entire energy system through Self-love. An open heart chakra brings about greater balance within the individual and the ensoulment of body, mind, and spirit. Ensoulment is related to one’s ability to harmonize the opposites (polarities) within. As one becomes more centered and less polarized, this opens one up to be compassionate in action, and develops one’s capacity to love and receive love. Within this framework of the chakras our vital force is in constant flux. It can either be strengthened or weakened with our individual input of energies. For instance, the seventh chakra relates to Self-knowledge (knowledge of divinity within). As we increase our knowledge of the Self so our belief system changes in regard to “who we really are” – are we the Self, the ego, or both? How we attribute meaning to the events that irrevocably change our lives will influence our perception. In turn, our perception affects how we experience life – the universe always reflects back to us what we believe ourselves to be. A lack of Self-knowledge is accompanied by a belief system (e.g. I am superior, inferior or no good) that creates blocks in the mental body, which in turn affects the emotions, and finally the physical body. The wounding experience gives rise to an instinctual emotional reaction and/or mental perception of a given situation, as if from a “template.” This so called template is formed since birth, from one’s earliest experiences through to the formative years. It is within this framework that Sankaran’s concept of “disease as delusions” or as “survival response” can be understood in context. “… all symptoms of a disease represent the survival mechanism called for in the original situation” (Sankaran, 1999:31). Healing is, then, about changing the “template” within oneself, and is connected with our ability to step beyond the veil of delusions by changing our individual belief systems (the foundation of core beliefs – the first chakra). If we believe something we accept it without questioning, if we question the validity of what we believe, it offers the opportunity to extend our knowledge and understanding. In time, one becomes less reactive (emotionally charged action), less calculating, and more spontaneous (third chakra) in a given situation. As the wounding experience gives rise to impaired chakra function (e.g. delusion), and at the same time, attracts certain experiences that reinforce one’s delusions - which may wound further there comes about a perpetual self-fulfilling prophesy. Disease symptoms are intrinsically related to areas weakened due to arrested development from trauma or abuse. For instance, the fourth chakra’s developmental tasks relate to our experience of love and unconditional acceptance of self and others, which leads to a sense of connectedness to all life. Yet the experience of shaming, rejection, and constant criticism from those who “supposedly” love us unconditionally (e.g. parents), gives rise to the potential manifestation of diseases of the heart, lungs, etc. On an emotional level, the wounding of the fourth chakra creates the feeling of deprivation, which may be reinforced by each encounter in life – perceiving every action and every word uttered by others as a form of rejection (delusion that one is inordinately unworthy of love). Another way of understanding delusions is through the eighteen stages in Scholten’s Element Theory (the periodic table) – these symbolize not only the developmental curve of an individual but also reveal our unformed ego state (first stage), our ego identification or where we possibly get “stuck” – the delusions. For example, stage two’s central delusion is that one is inferior. Hence one of the basic themes is “lack of confidence” in people needing a remedy from the elements belong to stage two (e.g. Beryllium, Magnesium, Calcarea, etc.). Conversely, stage ten (culmination or summit of one’s achievements) relates to the delusion that one is superior. The central theme that relates to this delusion is arrogance and haughtiness which are supported by one’s perception of external achievements and social status, measured against social values in terms of success or failure. Without saying that one should not strive to achieve the best one can, how do we define success or failure if it is not a subjective and value laden judgment. Any form of ego identification with external social, cultural or political values is always delusional. Delusions are the deviation from our true Self. When one identifies, for example, with the power appropriated from positions such as manager, President, etc. one is at risk of losing one’s identity or fading into insignificance (stage 15) as this power can be taken away either through retirement or redundancy. Ultimately, there is no such a thing as success or failure only evolution in consciousness that creates a sense of ONENESS of all life through our experiences. Every cell and every molecule in our body is conscious – listening to one’s continuous commands as beliefs, thoughts, emotions, feelings, and attitudes. As a result, they are constantly changing and modulating themselves to send out the exact energetic signals to attract the circumstances and experiences that reflect who we are in the form of self-fulfilling prophecy. The concept of “self-fulfilling prophecy” related above could be considered to be what we know as “maintaining cause” in homeopathy on a deeper psychological level. Maintaining cause is that which continuously keeps one from getting well and healthy in spite of the quality of healing one receives. For example, a tree planted on a wind swept cliff has the chance next to nil to grow into its original design, its magnificent self unless the causal factor be removed. It is from the deep recesses of one’s “maintaining cause” that a well selected homeopathic remedy may only be effective for a short duration and lack the power to create more of a lasting effect so alters one’s cellular expression. The more permanent changes may need to take place at the higher level by an individual’s own resolve to heal the self. In view from the above stated, the disease of cancer is not only deeply pathological, but is also embedded in deep hurt, and an unconscious sense of self-hatred and self-betrayal – an inability to truly express oneself creatively for fear of others’ poisonous criticism, rejection, envy, etc. This line of reasoning does provide certain insight into the development of cancer in many cases, and explains the prominence of Cadmium combinations used in cancer treatment in homeopathy (especially in advanced cases – refers to Arthur Grimmer’s Work). “These people also like to maintain what they have achieved, but they go too far in trying to hold onto it. They have all sorts of plans to keep things as they are and there is no stopping them. They are very conservative in their outlook and as long as everything is going according to the old plans and routines they feel fine. They will immediately vote against change of any form or description. They don’t really listen to others, and if they do it is only to pick up ideas that they can later use in their own schemes” (1996:52). The qualities elicited from the above quote can be summed up as being “stubborn; holding on at all cost; unchanging.” It would be hard for one to truly create changes in one’s negative perception about oneself with these qualities as part of the personality make-up. No homeopathic remedy or amount of radiation treatment can heal the deep delusional state that manifests as cancer. Only the soul’s desire to be healed can affect a change and healing. We can hardly discount the myriad causal factors, such as environmental toxins or emotional shock, to have an impact on our vitality. These often serve as a trigger for our innate susceptibility to the manifestation of diseases. Susceptibility, from the traditional homeopathic perspective, can be defined as the reaction of the organism to external (e.g. environmental) and internal (e.g. emotional and mental) influences or stresses. Some of us are naturally more susceptible to addictions or diseases than others. Yet, monitoring susceptibility is another way of perceiving a weakened vital force. Susceptibility may be related to our individual inherited emotional and psychological patterns. These reflect our wounded self and the effect of such is the alienation from our spiritual-core-self that leads to delusions. Ultimately, these patterns impact on our genetic make-up or may trigger our inherited genetic predisposition into manifesting addictions and certain bodily diseases. It follows, prior to the healing of one’s addictive behaviour or physical diseases corresponding to the specific chakra/s can take place, the wounded psychological developmental issues will need to be addressed and healed first. Typically, one’s repeated reactivity (“one’s buttons being pushed”) to a particular situation, person, or issue, reveals a wound that is yet to be healed. Our emotionally charged reaction is a sure sign that the original unconscious wounding (template) is being reactivated. The continued negative reaction (e.g. uncontrollable anger, fear of rejection) to the same stimuli can eventually weaken our vitality that leads to disease. One’s wound is where lies one’s “susceptibility” or predisposition to the development of certain diseases. An individual can either become more susceptible by ways of continuous suppression or may lessen the innate susceptibility by having homoeopathic constitutional treatment or other forms of vibrational medicine. Susceptibility, like vital force, is a fluid, changeable condition. Homeopathic remedy reduces susceptibility and removes the predisposition to certain disease manifestations simply because the vibrational frequency of a remedy satisfies or neutralizes the frequency of the susceptibility that produced the sickness in the first place. Today's propensity toward taking a myriad drugs (for recreational or medical purposes), excessive alcohol consumption, ingesting food far beyond satiety, unbridled indulgence in sexual gratification, or gross display of emotions such as rage, murderess intent, etc. can be considered as a form of "self-medication" to give “a quick fix” to our inherent susceptibility. Addiction is not just about cravings for drugs but relates to one’s inability to manage one’s emotional or physical cravings. These are repeated acts of self-affirmation and self-medication. A similar remedy satisfies a person's innate susceptibility (reducing the need to “self-medicate” with addictions), and the potency of a remedy affects the frequency levels of an individual. Brennan, a healer with the ability to perceive auras, observed in her work that: “the higher the potency of the homeopathic remedy, the higher the auric body it affects. The higher potencies above 1M work on the higher four layers of the auric field and the lower potencies work on the lower auric levels” (1988:150). As our auric fields become more balanced by having homeopathic remedies, our vital force strengthens. Hence, the natural progression is a healthier body. Addictions and diseases when understood the cause of their manifestations could be pathways to change and growth in consciousness. Diseases and addictions are not incidental manifestations that come out of no where. Edgar Cayce explained it this way: “All illness is sin. … This doesn’t means sins committed in the present life but sin expressing itself as illness, because it has not yet been expiated by the soul.” The word “sin” in this context, simply means the transgression of spiritual laws against oneself or another (e.g. self-loathing; hatred of another). It has nothing to do with morality or religiosity. Another way of considering the purpose of illness is thus: “Illness is a built-in service, a feeling based feedback system activated by harmful input stemming from a personal misuse of energy” (Marciniack). Self-healing, therefore, is a journey not only involves in one learning to manage one’s energy creatively, but is always accompanied by great personal courage and compassion for the self. We need courage because to heal ourselves at the soul level involves fundamental changes in our belief system, in our emotional attachment to certain behaviour patterns, events and people, and in our perception. Healing could literally mean breaking off many familiar ties, which means letting go of self-negating psychological agreements with family members, friends, peers, and/or social values. Those agreements of self-perception, habitual self-recrimination and self-condemnation through self-talk also need to be broken if one is to heal. One’s perception of being superior or inferior to others is delusional (e.g. others are more beautiful physically, apparently more intelligent, have a bigger house, etc. than oneself). What is one’s true state of being? All things external to oneself can be swept away by time and circumstances (unforeseen illnesses, catastrophe, etc.). What is left is pure consciousness. In this healing process, one takes the risk of speaking one’s own truth, perceiving oneself in a new light - which may be quite the opposite to how our parents, spouse, relatives, or friends perceive us or expect of us. This can be daunting because we are stepping out onto uncharted territories. It is much easier to walk the same old path, live the same old safe life, and allow the same old reactional behaviour to the same old stimuli, because these are effortless, comfortable, familiar, and instinctual (the limbic system in the brain). The old ways do not require us to make decisions or choices about “who we really are” or expend the effort to find out about what our values are - where our passion is. Courage also means truly believing in one’s own worth so that the journey of self-healing is worth all the pain, trouble and effort, however difficult, challenging, or alone it may be. Essentially, one’s own healing journey is that of a “Hero’s Quest” (finding one’s true self through confronting the challenges presented by life). On this quest, the moment one gains insight into the possibilities, there is carried the vibrational frequency which enlivens one’s whole being. Then one is inexorably changed. Compassion is a companion along the way we cannot afford to be without if we are to heal ourselves. The word compassion means “suffering with” . In the context of this essay, compassion is toward oneself – it means that one must be able to bear the pain of being a witness to one’s own suffering. Self-healing is a journey on which we continuously define “who we really are” at the juncture of each conscious choice. It is akin to a journey into the underworld (the unconscious) to retrieve those precious bits and pieces discarded when growing up because one’s parents or peers may have “disapproved”. For example, adults often teach children to tell “a little white lie” in order to hide family secrets from others. A little white lie (as opposed to the morally unacceptable lies), therefore, carries social and cultural agreements that allow one conveniently to get out of “sticky” situations without having to honour oneself and others, or going through the trouble of finding out one’s own truth (the corresponding energetic center is the throat chakra) in relationship to the event. In time, this energetic blockage steps down to the physical manifestation of disease in areas related to this center. The challenge for one not telling “a little white lie” is how we can be authentic in our encounters in life. The very essence of being authentic precludes any possibilities in causing others pain or harm and, at the same time, rules out habitual negative self-criticism, self-recrimination, or self-blame. One’s decision to whether tell a little white lie or not, in a given situation, is not about the morally right or wrong thing to do, but has everything to do with how one manages one’s energy because the energetic imprint behind such seemingly inconsequential “little white lie” is the alienation from the Self. Honesty creates connections between individuals, whereas dishonesty generates an ever widening gap because our auric field is a broadcast station open to anyone who can read energies. As we acknowledge our own worth, rather than allowing ourselves to be manipulated or defined by social values and trends, or others’ opinions, we come closer to the center of our own being that will lead to a more balanced self at every level. Cayce states “healing of the physical without the change in the mental and spiritual aspects brings little real help to the individual in the end”. At the fundamental level, cancer can be considered as a symbolic representation of the state of our being - one literally consumes oneself from inside when the creative outer expression of the self is non-existent. If we cannot live a life that affirms “Who We Really Are” at every turn, then there is no deeper betrayal of the Self. Abandoning oneself in courting the collective values defined by external images and social masks generates an increasing sense of emptiness within. A life that affirms our true Self requires us living according to one’s inner truths and obeys one’s inner laws. This can only come about from one truly loving the Self/self (the heart chakra) in our encounters in life. “Do we have a choice in every circumstance?” Of course, we do. The question is whether or not we are prepared to pay the price that comes with every choice we make. Organon of the Medical Art (Hahnemann, S), (1997) Edited and annotated by O’reilly, B. W. (based on a translation by Decker, S.) Birdcage Books, Redmond, Washington, U.S.A.
Ai Ling Makewell did a great job in highlighting the issues connected with healing. IMHO, it all boils down to this- inspite of the outwardly manifested symptoms/disease, is he/she utilising the sojourn on this earth for realising the higher purposes of living. fe; Stephen hawking the noble laureat is comparatively healthy than one whiling away his time just eating and mating and leaving all his burden on his wife/community. Sri Ramakrishna Paramhamsa, Sri Ramana Maharshi and several saints whose teachings are even now healing many a troubled mind had no issues at any level to be resolved and yet they too suffered from cancer. So the outer expression can't be an indicator of one's stage of evolution/realisation and it bears an important message to all of us to see if the patient before us is a diligent or non-deligent one and see what needs to be cured in each and every case.